Many 3D models are intended to be printed as hollow objects (for example, you want a finished cup, but it’s designed as a cylinder). Such models are sealed at both ends and usually have details or patterns on the outside. They look solid but are intended to be printed as a single-wall-outline pot or vase. Such designs often produce the best surface quality but can be used only for single-walled objects. 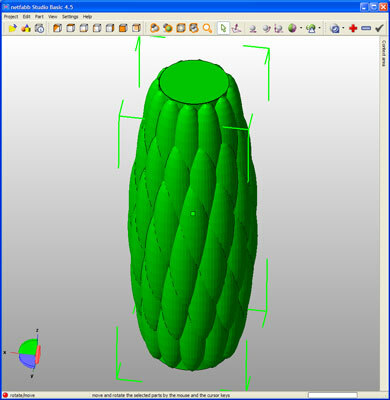 Slic3r has a specific setting for cylindrical versions of such objects; it also allows for almost continuous printing without any extruder retractions or machine moves. This setting is called Spiral Vase (see the following image), which is available in Slic3r’s Expert mode. Set the layer height and number of solid bottom layers. Slic3r automatically removes the top layers, so you end up with a single-wall outline of the object and a solid base. The hollow-pot 3D model printed as a Spiral Vase. The vertical Z axis never stops being raised slowly, resulting in a seamless print. Even more impressive, after the solid base layers are printed, the single wall outline is one single extrusion — usually spiraling around while the Z axis moves up ever so slightly as the print head rotates. All this movement makes printing much quicker, with no visible seams on the printed object, because the extruder flow isn’t stopped for a change of layer height. 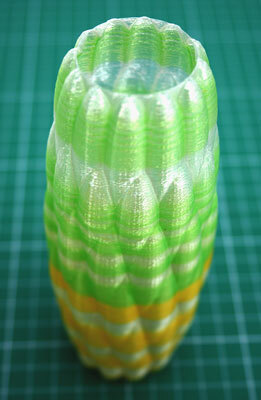 Using a bigger nozzle is ideal for printing single-walled objects with the Spiral Vase setting. You can still select fine layers, and the wider nozzle provides a thicker single wall, giving your printed object more strength.